Most people who have taken pictures know that George Eastman was the inventor of the first camera that used a roll of film. What most people do not know is that two years before George Eastman invented his first Kodak camera, he and Franklin Millard Cossitt received a joint patent for a roll film camera. On November 30, 1886, United States Patent No. 353,545 was granted to G. Eastman and F. M. Cossitt for the Detective Camera. Franklin Millard Cossitt was born on May 16, 1863 in Smith Falls, Ontario, Canada to Levi Cossitt and his wife, Mary McCallum. He emigrated to The United States in 1880 and became a U.S. citizen. Franklin Millard Cossitt was the 3rd great grandson of Rene and Ruth Cossitt. Franklin married Carrie Estelle Grey on February 26, 1886 in Rochester, New York. They had one child, a son they named Millard Grey Cossitt who was born in 1891. Because of Millard Grey Cossitt's divorce, his two children took the name of their step-father so there are no living descendants of Franklin Millard Cossitt who bear the last name of Cossitt. The Detective Camera consisted of a leather covered box that weighed 4 pounds. Its dimensions were 6 x 6 x 10 inches. Inside was a shutter that was a hollow, truncated, triangular prism of sheet metal which was on a pivot. The open base faced the lens and during exposure, the apex of this funnel-like device traveled across the film. In today's world, it would be similar to a focal-plane shutter. The camera accepted either a roll film holder for negative paper (48 exposures) or a holder for 4" x 5" glass plates. There were many production problems from the start and only 40 of these cameras were ever produced for sale to the public. One of these Detective Cameras may be in the Smithsonian Museum, but no others are known to exist today. In 1885 George Eastman began the production of machine made photographic paper, as opposed to hand coated paper being manufactured by The Anthony Company. Franklin was an operator of the Eastman's paper coating machine. 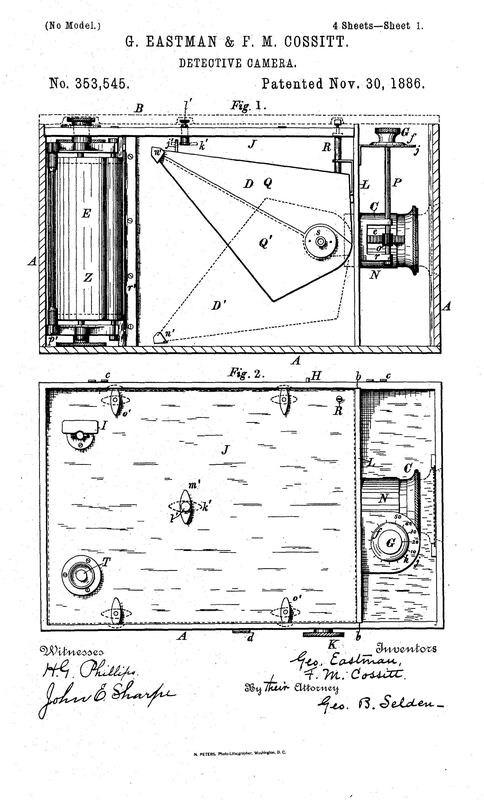 In January of 1887, just two months after the patent for the Detective Camera was granted, Eastman discovered that Franklin Cossitt had been hired away by his chief competitor, The Anthony Company. There were allegations of infringements of Eastman's patents for the photographic paper manufacturing machine which were never proven. 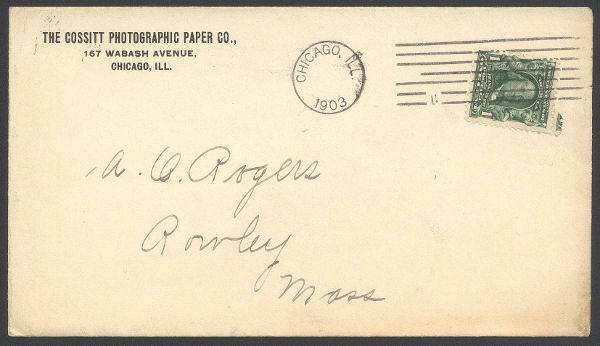 After leaving The Anthony Company, Franklin Cossitt formed the Cossitt Photographic Paper Company in Chicago. In 1906, while residing in Binghamton, New York, he received a US patent which was for an improved process to coat cellulose nitrate film with emulsion. He received his last patent in 1920. Franklin died on December 23, 1936 in Toronto, Canada where he is buried. Carrie died there in 1941. Copyright © 2010 Cossitt Family Association Inc. All Rights Reserved. First published November 5, 2010, updated June 15, 2012.